I’m a lucky girl. Things aren’t always perfect, but I get to do what I love. My house is warm and filled with love. I get to work with the neatest people on fun projects. One of the projects I am working on is a kitchenette that is going to become a “theater concession” stand of sorts. The clients are going to purchase a cute popcorn popping machine that will sit on the counter. Fun, huh? Well, as fun as it is, we have to make sure that this machine, which has a hot plate that gets to some pretty high temps, doesn’t cause any counter top damage. I started doing research and interrogating talking to tradesman, and I’ve discovered a few very interesting things. I think you’ll appreciate this info as you embark on your own counter top shopping. In the kitchenette project, we narrowed our options down to granite and quartz. We needed a solid counter top because we are installing an undermount sink for easy cleaning purposes, and because of the heat from the popcorn popper. 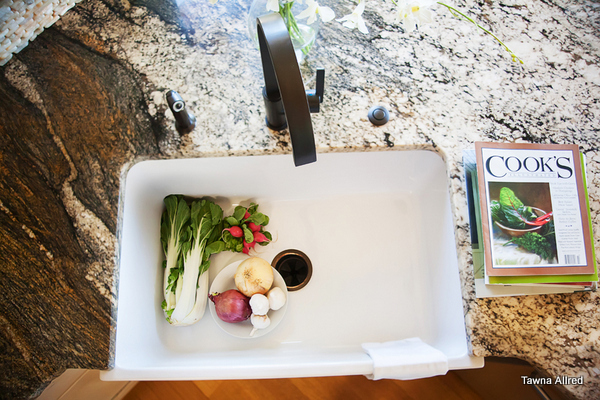 Granite has been used for so long and in so many wild applications, it is falling out of favor. The plus side is granite is also becoming more affordable. Quartz has a quiet look people are more drawn to lately, and has the reputation of being indestructible, like granite. The down side? Even though it is man-made, it is usually more expensive than granite. We began to wonder which one we should choose. Style played a factor, but we went with granite, and here’s why. Quartz counter tops are conglomerates mixed together and solidified with resin. While they might be very durable, we were warned that the heat from the popcorn machine would leave a permanent etch that couldn’t be removed. Granite is all natural. It is used in many of the most important buildings in the United States and around the world. Did you know that the Statue of Liberty sits on a slab of granite? 1) If you are wanting the most solid, durable granite, get the 1 & 2 grades. These types of granite aren’t as pretty, but they don’t have other rocks/minerals mixed in. Their strength stays the same through the whole slab. 2) Black granite, honed or shiny, is really hard to keep clean. Even when you clean it, it will show the water marks where you wiped. Keep this in mind if you are considering black. Some people don’t care. It makes other people want to pull their hair out. 3) If you find a gorgeous granite you love, and it is busy, you should do one of two things: use the same granite as the back splash, or use very plain subway tile. Take either of these options clear up to the bottom of your upper cabinets. I know marble is coming back in a huge way. It has a soft, beautiful look. It goes with the gray neutrals everyone wants. I also understand the revolt against busy granites. We’ve had busy counter tops and busy back splashes for far too long. I don’t think that granite will ever go away though. It’s far too practical. As much as other designers say the etching and softness of marble counter tops aren’t a big deal, I am hesitant to recommend it or use it in kitchens. I use my kitchens hard! So, I still go to granite time and time again. Marble is a wonderful material to use in bathrooms. I love quartz counter tops too. Most kitchens don’t have commercial popcorn poppers sitting on the counters, so it’s a very good choice. Here’s another helpful tip with quartz when price checking: Cambria is the most expensive. It also looks the most like granite, with a more depth and character than other quartz options. Caesarstone is priced in the middle, and other brands usually fall in a price range below Caesarstone. Did you like this post? Was it helpful? Please share with your friends on Facebook and Twitter! Great info, Tawna! It’s always a question which solid surface to use, so the info is appreciated. Glad you found it helpful Pamela!